Licence and License are two words in English that are liable to cause confusion for users. The post: Licence or License – Definitions, Correct Usage with Examples handles this confusion by way of defining the two words and explaining their use/usage with illustrative examples. These words are liable to cause confusion in British English. In terms of spelling convention, you can spell the words ‘license’ or ‘licence’. Both are nouns and are correct. These are everyday words, but there is a need to look closely at them so that we do not confuse them in usage and so that we identify the difference or similarity between them and most importantly help others in when it comes to Licence or License – Definitions, Correct Usage with Examples. She requires a licence to have a stall in the market. I have a licence to drive a car. He has applied for a pilot’s licence. Only the designated authority has the licence to print money. He got a licence to import rice into the country. The government will revoke the Company’s licence. Many youths take their liberty for licence. His vehicle licence will soon expire. The government has issued a new driver’s licence. She believes she has the licence to do whatever she wants. The council have licensed him as a street trader. James Bond is a licensed killer. The restaurant has been licensed to sell alcohol. He is a licensed grocer. In some countries, their citizens are licensed to carry arms. He was licensed to sell lands in the estate. He is a licensed importer of sugar. The government licensed the company to produce locally made goods. Citizens are not licensed to carry arms indiscriminately. Teenagers are not licensed to drive in some countries. 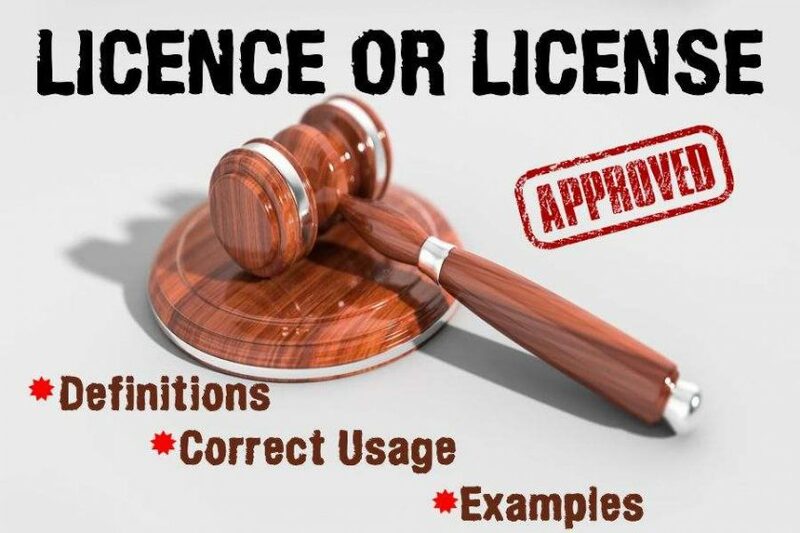 Many ask if it is a licence or a license as a way of identifying the difference between these two words. The major difference between these two words is that is one is American spelling while the other is British spelling but both are acceptable usage. In American English, both the noun and verb are spelt license. In British English, Licence is nominal while License functions as a verb. The two have to do with the type of spelling convention you subscribe to. These two words are also related to our subject of discourse. The word licensee refers to the person, corporation or organisation that has the authorisation to do something; that is, a person who holds a licence, especially one to sell alcoholic drink while a licensor or licenser, as some refer to it in some quarters, has to do with the person, corporation or organisation who grants a license or gives a licence to another. Licensure is one of the words related to licence or license. What does it mean? Licensure refers to the granting of a license, especially to practice a profession. Licentiate refers to somebody authorised, who has been granted a license to practice or teach a profession or a skill; that is, a person who has received a formal attestation of professional competence to practise a certain profession or teach a certain skill or subject. Licentiate also refers to a degree between that of bachelor and doctor which only certain European Universities now award. Licentiate also refers to the person who holds this degree. Poetic licence is an intentional disregard of or deviation from conventional rules to achieve a certain effect. In other words, poetic licence is a deviation from fact, form, or rule by an artist or writer for the sake of the effect gained. Most literary works draw so much on poetic licence, especially the poetry genre. So, when you see the word Poetic Licence, just think of that freedom a writer or artist has to rearrange the facts of ordinary life in order to make a more striking effect. We can also call it artistic license.